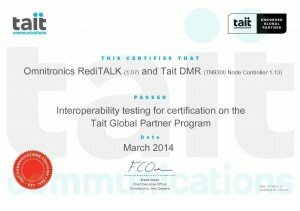 Tait Communications has officially certified that Omnitronics RediTALK has passed Interoperability Testing with Tait DMR for Tier III. This certification for RediTALK is the culmination of months of collaboration and co-development to ensure that RediTALK can fulfill the expectations of many of Tait’s customers worldwide. RediTALK is a purely IP based console that connects to digital radios over IP, without the use of a central server. It includes advanced DMR Functionality such as Individual Calls, Text Messaging, Status Messaging and GPS. It can also interconnect to other analog and digital protocols supporting digital migration and interoperability. Omnitronics is an official Tait Communications Endorsed Global Partner with both companies working together for over 30 years. The new interface is also available on Omnitronics’ DX-Altus Radio Management which provides organizations with even further choice. Both products are currently on display at IWCE in Las Vegas at Booth 2039.